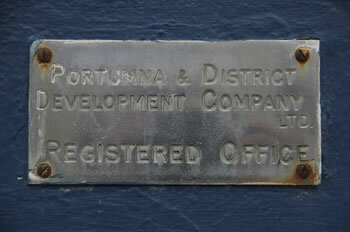 Portumna Development Company has done great things for Portumna, Co. Galway since it’s creation in 1947. Monsignor Joyce suggested the forming of the Development Company, seeing that committees formed and then dissolved themselves as soon as their purposes were achieved or not achieved at first attempt. Unfortunately he died before the full formation did see the draft of articles and suggested some changes. 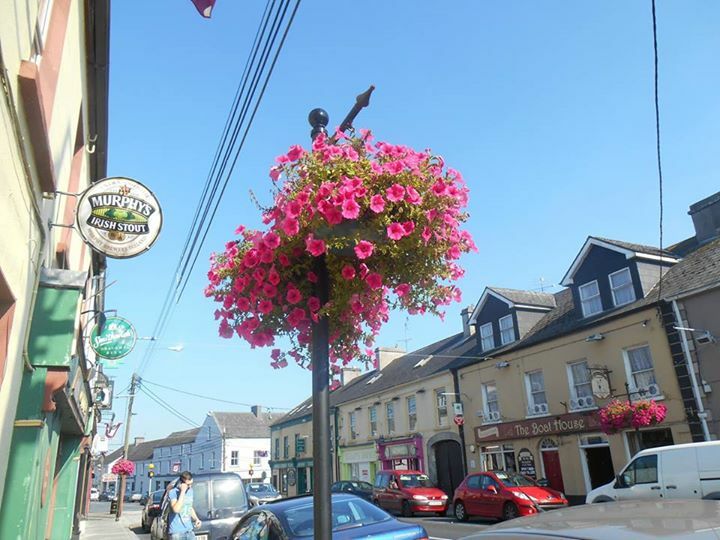 Portumna won the name “Model Town” for itself among Irish Country towns. The company was formed with £500 share capital divided into 10,000 shares of one shilling each. A full cross section of the community were and are shareholders thus giving all an interest on the work of the company. Their first move was to acquire the premises of “Civic Buildings” on Abbey Street. 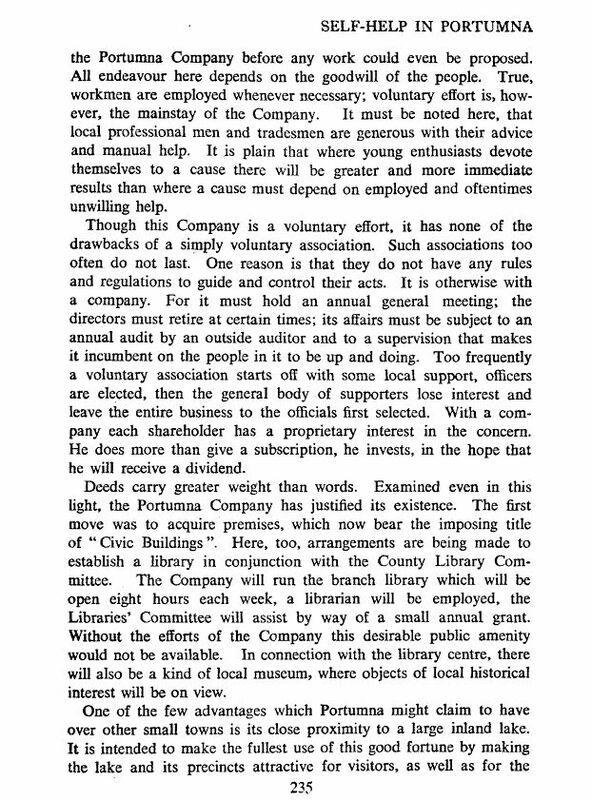 The company ran the branch Library and employed a Librarian, without the company Portumna would not have had this desirable public amenity, imagine Portumna without a Library. It also housed a Local Museum with objects of Local historical interest on view. They were the group that realised that with Portumna being on Lough Derg and the corner of three provinces, this small town had an awful lot to offer, so the Development Company commenced the work of providing a proper swimming area and improved approach to the lake, which has been continually upgraded over the years to the great facility we have today. Monsignor Joyce saw the beauty in Flowers and Trees when he visited Switzerland and felt that why could that not be done at home. The company and the town has inherited his love of flowers. As can be seen each and every year since. A great inheritance for a town to have and long may it continue. A Chapter of history of Portumna was concluded when the Department of Lands purchased the Harewood Estate better known as Clanrickarde Estate. 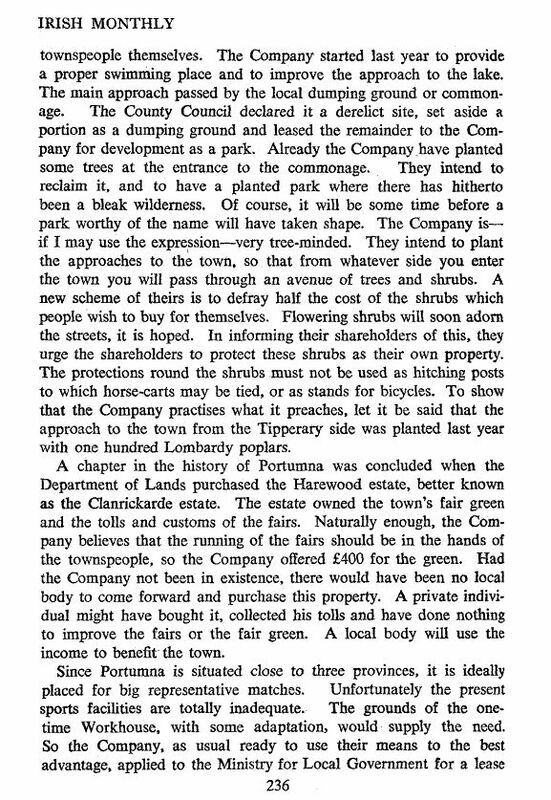 The estate owned the towns fair green and the tolls and customs of the fairs. 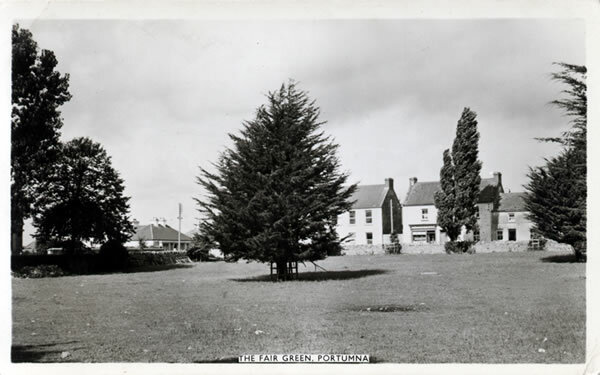 The Development Company believed that running of the fairs should be in the hands of the townspeople, rightly so, and duly purchased the green for £400. Without the Development Company all this work and lots more would not have happened or we would be relying on the the goodness of government agencies. 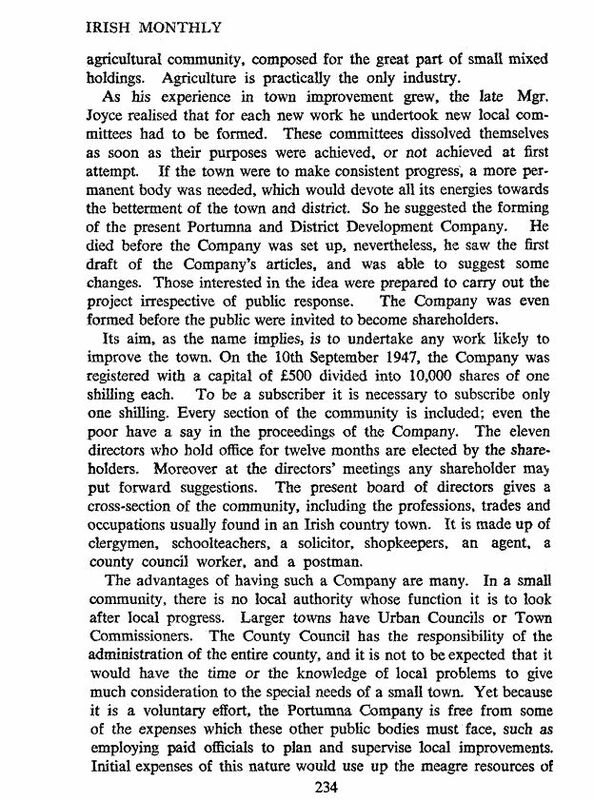 The Development Company also produced the printed form of information called the “Portumna Review”. 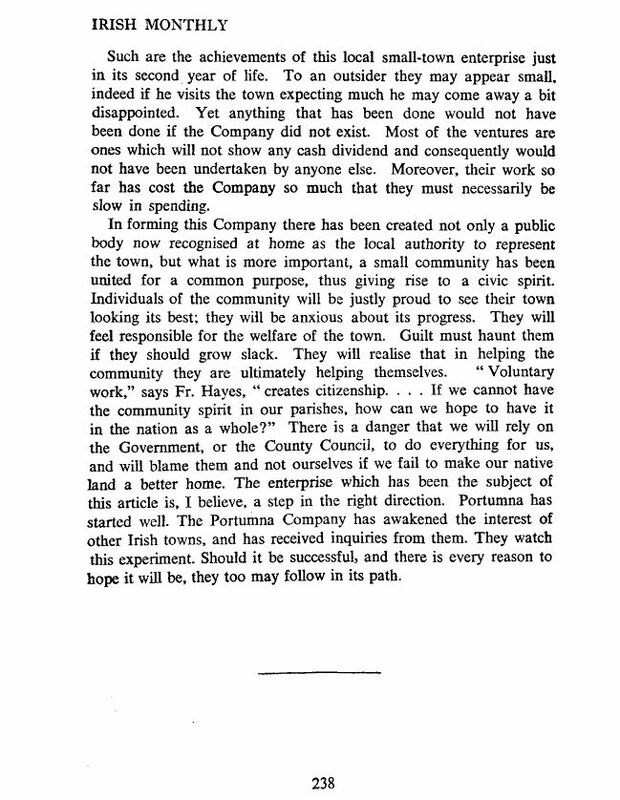 It had titles such as “Portumna 100 Years Ago”, “The Portumna Bridge and Parsonstown Railways” in 1947, with a 1848 edition featuring the Trial of Wilfred Blunt in 1888 with other titles as “Suggestions For Killing An Association”, “Give Us A Hand” and “Why Not A Town Of Trees And Shrubs”. 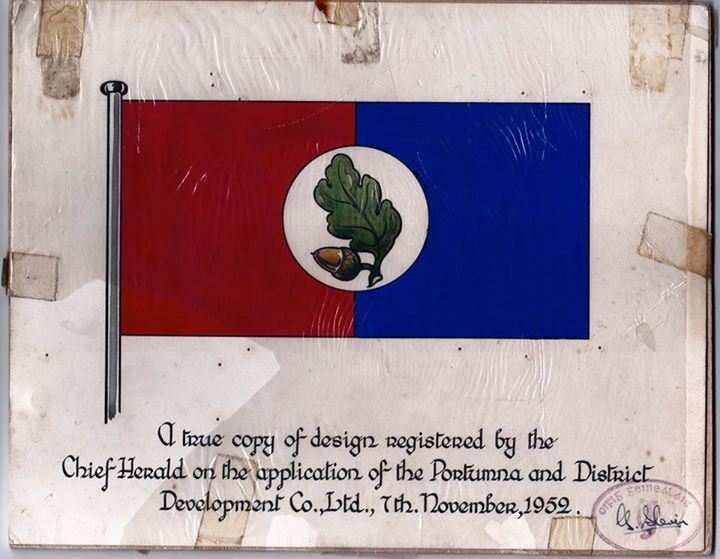 Also the production of the Portumna Flag featured a few weeks previously. 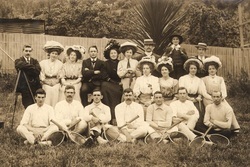 The Company’s biggest undertaking each year was the running of the “Civic Week” festival with a visitor booklet provided also. The fore runner to the festival we know in Portumna of the now. The Development Company is to represent the town, but also more importantly a small community has united for a common purpose thus giving rise to a civic spirit. Individuals of the community will be justly proud to see their town looking it’s best and anxious about it’s progress. Fr. Hayes said “Voluntary work creates citizenship. If we cannot have the community spirit in our parishes, how can we hope to have it in the nation as a whole”. There is the danger that we will rely on the Government or the County Council, to do everything for us, and will blame them and not ourselves if we fail to make our native land a better home. Portumna Development still going strong to this day with projects like Portumna Tennis Club and many more. Still the Model Company for any town. Portumna owes the Development Company a huge debt of gratitude. Thank you from all. 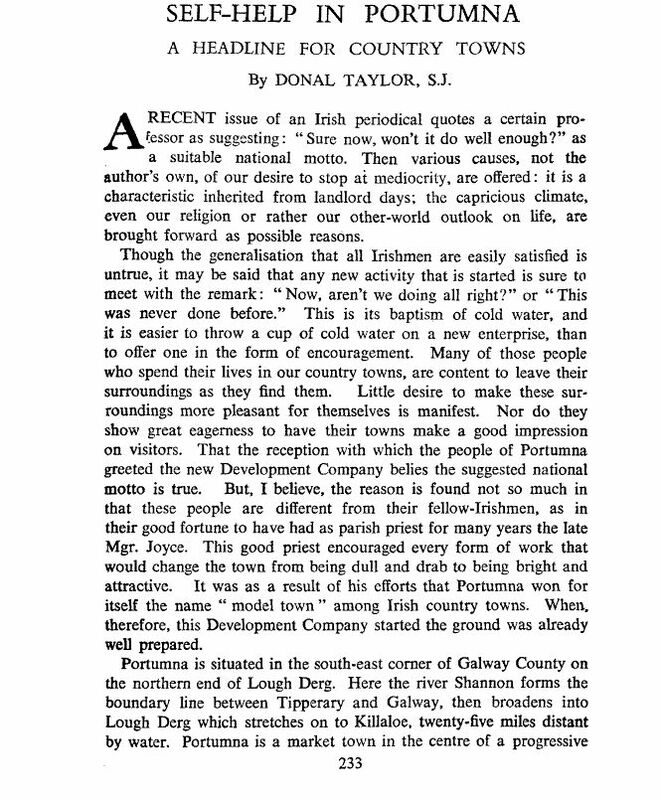 Attached pictures are from an article done on the development company in May 1949 titled “Self Help In Portumna – A Headline For Country Towns” by Donal Taylor, SJ. A lovely piece in “The Irish Monthly” magazine. Portumna Fairgreen, The Fair Grounds and Portumna on Fair Day. 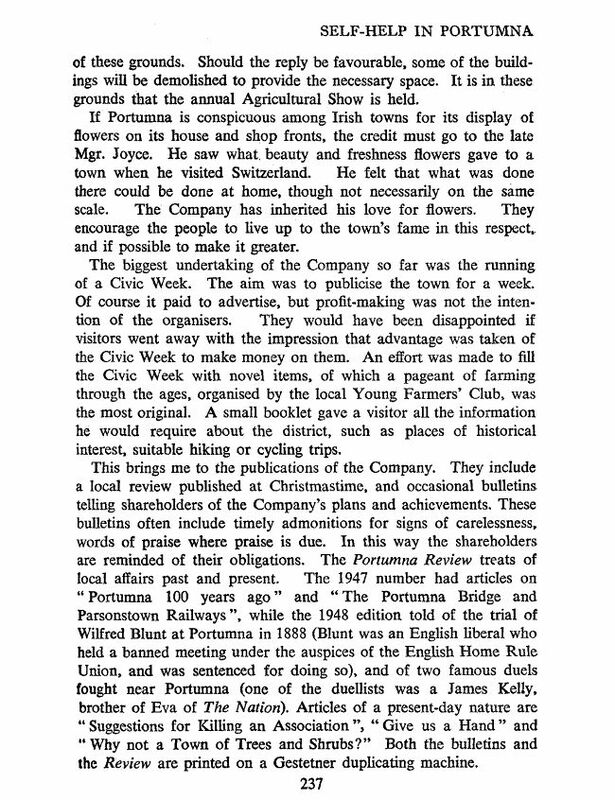 An still to this day the town inheritance – a love of flowers.